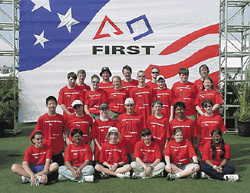 2000 was our rookie year and we jumped into the FIRST Robotics Competition without a clue as to what it was all about. There was little local mentoring help available at that period of growth in FIRST, mainly because it was also the founding year of the FIRST Regional Committee and the SBPLI Long Island Regional. Prior to this year the few local teams involved in FIRST went to Regionals in other parts of the country and our students, teachers and sponsor engineers had never had an opportunity to witness a FIRST game before. "Force to be reckoned with." Our robot was named REBOS, but was affectionately refered to as the dump truck. Behind the scenes Mr. Hans Zobel of FESTO (our team and Regional sponsor) decided to make the leap into forming and sponsoring a team and, assisting Fred Breithut of the School-Business Partnership of Long Island (SBPLI) , creating the SBPLI Long Island Regional as part of a broad plan to increase the presence and impact of FIRST in the local area. Mr. Zobel talked our superintendent at the time into supporting the formation of our robotics team. However, the teachers (Mr. Foley, Mrs. Cassans, Mr. Tiu) and FESTO engineers (Mr. Schuler, Mr. Chant, and Mr. Drexel) who became responsible for the implementing of that plan learned of that commitment and FIRST only one week before the 2000 game kickoff. Students for the initial core of the team were drawn from Mr. Foley's Science Research class. The SBPLI Regional was held under a tent on the 156 acre Selden campus of Suffolk Community College, 533 College Rd. The teachers, engineers, and students rose to the challenge and worked very hard for the payoff of earning 2nd seed in the inaugural SBPLI Long Island Regional and formed the #1 alliance with Team 15 - Lola Rodriguez De Tio/Laura Mercado/San German InterAmerican High Schools (San German, Puerto Rico) and Team 287 - William Floyd School District (Mastic Beach, NY) . We also won the Motorola Quality Award, and although we didn't take the big prize at the Long Island competition, we did go on to experience the fun and excitement of Nationals at Epcot. Our first ever robot design took a very simple approach to the game. It was at heart a dump truck mounted on a scissor jack. The game involved moving balls from the alliance station to a goal trough about 5' off the ground at mid-field, gathering additional balls from the field or balls that have been dropped by robots, and hanging from a bar at the end for extra points. Our game strategy was to raise our dump truck to the top of the alliance wall, so it could be easily loaded by the human players, then simply drive balls to the trough, dump them in, and return for more balls. At the end of the match our robot used hooks mounted on the side of the dump truck to latch onto the bar while the scissor jack drew the robot up to hang. It was a simple and effective design for our "first" time out. No CAD or more sophisticated upfront planning for us this year, we just roughed out a design and laid it out by building it. 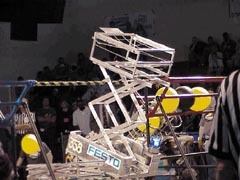 The most innovative design that year was probably the robot(s) that would immediately latch onto the hanging bar at the start of a match and employ an arm to "steal" balls from their opponents goal and place them in their own. Championship was held in April under tents pitched in the parking lot out in front of EPCOT. We had no graduating seniors in this our first year.